Custom Fields or Tags to best segment your data? As part of the OnePageCRM Learning Centre, we’ve been hosting advanced webinars on various topics over the last few months (click here to check the list of available webinars). One of our most popular turnouts has always been on the topic of “Segmentation and Reporting” in OnePageCRM. With that being said, it is the most frequently asked question at this webinar which has spurred me to write this blog post. So I guess you’re wondering, what the question is…..well here you go; why should I use Custom Field’s over Tags or vice versa when segmenting my data? Those of you who already use OnePageCRM will probably already have your own opinions on this one, but today I’m going to give you the pro’s and con’s for both, so you can make up your own mind. Custom Field’s are slightly more secure than Tags. In saying that I mean, only an Account owner or Administrator can add/edit/delete a Custom Field from a selected group of contacts. That means, if you’re a User on the account and need that one extra field – you’ll have to request this addition from the Account owner or Administrator. The advantage? Well it eliminates the User (perhaps mistakenly) deleting a Custom Field from an entire group of contacts, they’ll have to be removed one-by-one (which is hassle right?). ALL users on the account can easily add or remove Tags from selected groups of contacts. As mentioned above – only the Account Owner / Admin can add or remove Custom Fields. Tags are already automatically filtered for you and appear on the left hand side of your screen. 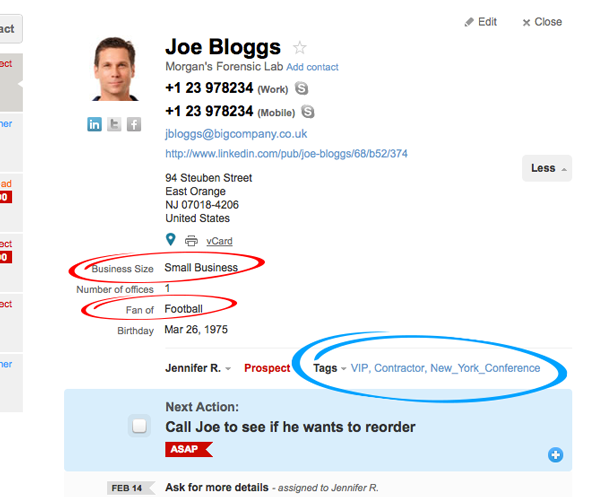 The Tag filter also includes the number of contacts in the CRM with that Tag assigned. There are multiple options with Custom Fields, including single line text, multi line text, number, dropdown, date, Anniversary date and checkbox (my favorite) – meaning multiple ways to segment your data! So if for example you’re looking to segment your data based on industry type, you can create a custom field with a dropdown and then assign the correct option to your contacts. To then find the data, you can run a Filter or Advanced Search. Nice eh!? Remember filters are updated in real time meaning, if a contact meets the filter conditions it will appear there automatically. As I’m a very “unbiased” user of OnePageCRM, I can see it from both sides, hence my scoring of 3/3. But heck, let’s throw it out to a vote, what type of person are you? 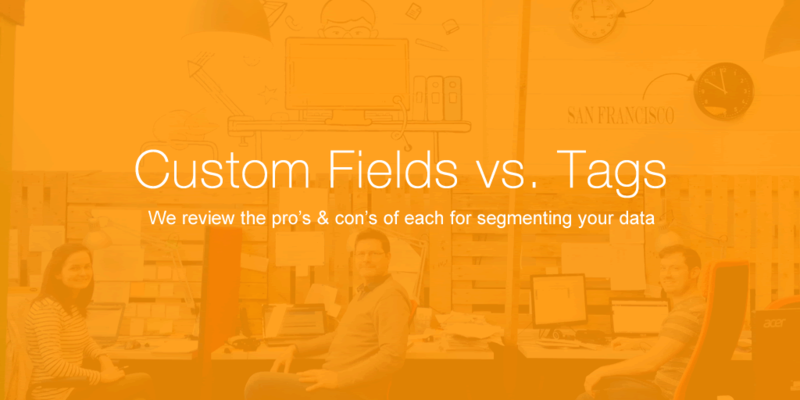 Do you prefer Custom Fields or Tags for segmenting your data? 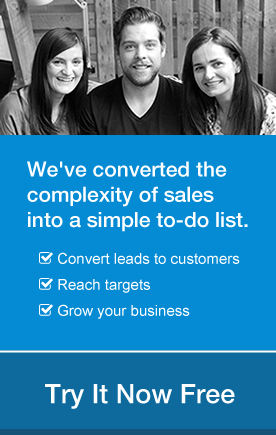 Coming from a background in various industries like Insurance & Healthcare – main focus always been on Customer Success - Zappos style of course. Other interests include; taking part in outdoor activities, running & exploring new places.